Human Misery for Fun and Profit - Clinton, O'Brien, Andrés, Epstein ~ Amazing Polly - a look at "elites" using (Puerto Rico & Haiti) disaster and misery for profit and entertainment under so-called humanitarian missions, likely as a front for human trafficking. The swamp is deep and all connected. Child Trafficking Agent Called In on Smollett Case ~ Amazing Polly - This is not about Jussie but is about the swamp surrounding him. "The Octopus Of Global Control", book by Charlie Robinson, recently on Tin Foil Hat and Higherside Chats. Controversial encyclopedic non-fiction, uncovering some of the biggest conspiracies in modern world history featuring 500+ quotes in a way that is both horrifying and hilarious. "New Study Claims Conspiracy Theorists More Likely to Become Criminals!" by Truthstream Media (2019-03-25) - Ya, thoughtcriminals. This short 4 minute video is more lighthearted than their usual deep content. 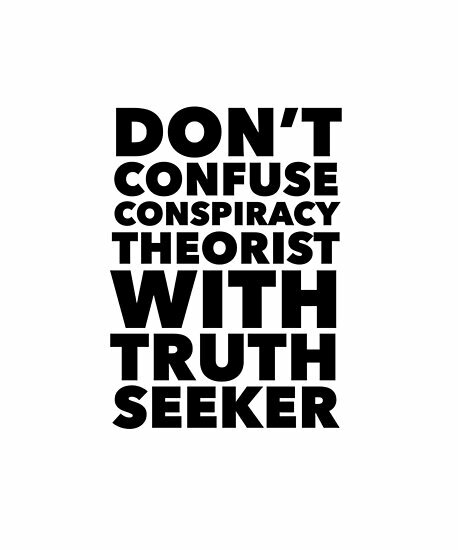 Don't confuse conspiracy theorist with truth seeker.